Jimmy Kimmel was born in Brooklyn, but raised in Vegas. He played clarinet in his high school's marching band, which once performed at Wayne Newton's house, for Newton's birthday. He started in show biz as a disc jockey in Phoenix, Seattle, Tampa, but was fired in all three cities. He had more success in Los Angeles, where he was "Jimmy the Sports Guy" on KROQ-FM. He co-hosted Win Ben Stein's Money, voiced puppets on Crank Yankers, co-hosted the delightfully chauvinistic The Man Show, and made fun of Fox's football coverage on Fox NFL Sunday. After ABC fired Bill Maher from Politically Incorrect in 2002, Kimmel was given the late-night slot following Ted Koppel's Nightline. Jimmy Kimmel Live was actually broadcast live when it started, but now it is taped a few hours before broadcast, just like the other late-night shows. On the show, cousin Sal is really Kimmel's cousin, Uncle Frank (who died in 2011) was really Kimmel's uncle, and Aunt Chippie is really Uncle Frank's ex-wife. Jimmy Kimmel Live leapfrogged over Nighline into the 11:35 timeslot in 2013, putting Kimmel head to head against Jay Leno on NBC and David Letterman on CBS. Remember Omarosa Manigault-Stallworth, the most conniving contestant on the first edition of The Apprentice, who seemed to be caught in several lies on that show? After she was "fired" by Donald Trump, she was scheduled to appear on Kimmel's show, but stormed off the set when she saw Kimmel's crew setting up a lie-detector test. 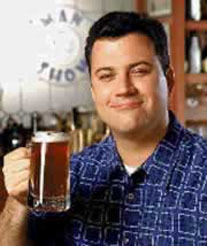 Kimmel is "mildly" narcoleptic, and says he once fell asleep while he was taping Win Ben Stein's Money.